Explore Barcelona or Valencia from a practical and functional viewpoint, with excellent value for money. Comfortable rooms that are perfect for urban travellers, thanks to the strategic location of the hotels which have excellent transport links to all the city's main attractions. Both Expo Hotel Barcelona and Expo Hotel Valencia have an Urban Club pool and terrace, open from May to September, where you can taste delicious Gourmet hamburgers while you enjoy the view of the city. The hotels also offer a full breakfast with a varied choice of foods, and we can provide all the information you need to discover the city. 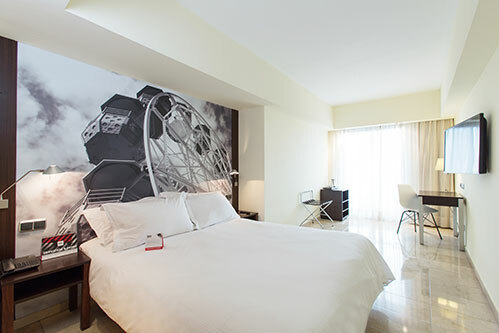 A highly functional hotel with the best service and a perfect location for urban travellers. All the services you need at this practical urban hotel that offers you great value for money. Just a few minutes from the centre of the old town and in one of the city's busiest and most popular shopping centres. Just 5 minutes from the Trade Fair Centre and the Conference Hall.